Drivers distracted by their devices are a well-documented, rising cause of traffic crashes, but there are a growing number of pedestrians, too, who can become oblivious to traffic around them. A report released today by the Governors Highway Safety Association shows that the number of pedestrians killed in traffic jumped 11 percent last year, to nearly 6,000. That's the biggest single-year increase in pedestrian fatalities ever, and the highest number in more than two decades. "It is alarming," says GHSA executive director Jonathan Adkins, "and it's counterintuitive." "There's been an assumption that, because of increased safety of vehicles as we move toward semi-autonomous vehicles, that traffic deaths were going to go down," Adkins says. "We're seeing just the opposite, unfortunately, with a particular spike as it relates to pedestrians and cyclists." Last month the National Safety Council reported that traffic deaths overall went up 6 percent nationwide in 2016. Maureen Vogel, spokeswoman for the council, says it stands to reason that pedestrian fatalities would rise as part of that trend, but she and other safety experts did not expect the rise in pedestrian deaths to so significantly outpace other traffic-related fatalities. "A perfect storm" of factors spurred the increase, Vogel says: A stronger economy and low gas prices have put more cars on the road and have people driving more often, "but that is really only part of the story ... so something else is at play here." One possibility can be seen during rush hour in downtown Chicago just by looking at both the drivers of the dozens of vehicles inching through traffic and the scores of pedestrians crossing the busy intersections. One thing many have in common is that their eyes are down, staring at their phones. "We are crazy distracted," says Melody Geraci, deputy executive director of the Active Transportation Alliance, a Chicago group advocating for better walking, cycling and public transportation options. "After speeding and the failure to yield, distractions are the number three cause [of pedestrian fatalities], particularly by electronic devices." 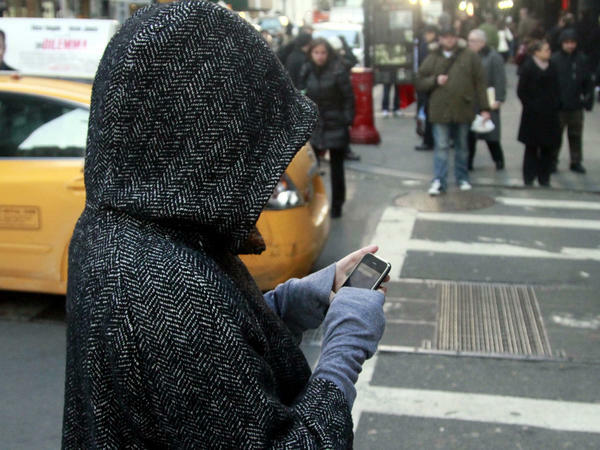 "We have noticed over the years increases in the number of injuries related to distracted walking — pedestrians being distracted by cellphones and then injuring themselves because of that distraction," says Vogel, referring to National Safety Council data. "So it's entirely possible that is at play, not just on our roadways but on our sidewalks." But a bigger problem remains vehicle speeds. "Speed is a killer for sure," says Geraci. "If a pedestrian is struck at 20 miles an hour, they have a 10 percent chance of dying. If they are struck at 40 miles an hour, they have an 80 percent chance of dying." New York City lowered its speed limit on most streets to 25 mph a couple of years ago to help protect pedestrians; other cities are considering slowing speeds, too. And researchers are looking through the data to see if they can come up with other ways to make streets safer for those crossing on foot. According to the GHSA report, 74 percent of pedestrian fatalities happen at night, and 72 percent of those killed were not crossing at intersections. Another significant factor is alcohol. The GHSA report indicated that 15 percent of pedestrians killed each year are hit by a drunk driver, while 34 percent of pedestrians killed are legally drunk themselves. That's right: one-third of pedestrians killed in traffic had blood-alcohol (BAC) levels above the .08 threshold for drunk driving. "We've done a good job in highway safety in telling people that when you go out to the bar and you're drunk, don't get behind the wheel," says Adkins. "But you should really be careful about walking, particularly if you're walking at night, and you're walking a distance. You're not gonna have good judgment, a car's not gonna see you ... [so] don't walk home at night when you're hammered." He and other safety advocates say lower speed limits, better road designs and more sidewalks can help reduce the fatalities. So can new vehicle technologies that alert drivers to the presence of pedestrians — but many drivers don't understand it, don't know how to use it and thus disable the technology. "It's not as if there aren't solutions out there," says Adkins. "We know what needs to be done, it's just having the will to do it." It's the oldest form of transportation - walking - and new evidence shows it's getting more dangerous. A new report by the Governors Highway Safety Association shows the number of pedestrians killed in traffic jumped 11 percent last year. That's nearly 6,000 people who died in collisions with vehicles, and it's the biggest single-year increase in the four decades these statistics have been tracked. From Chicago, NPR's David Schaper has more. DAVID SCHAPER, BYLINE: I am standing at a pretty busy in downtown Chicago. And it's certainly not the most dangerous place in the city for pedestrians, but there are some factors here that could put those on foot at greater risk. First of all, it's early evening, so it's dark out. It's also raining lightly, and a lot of the people who are out and about are not looking where they're going. They're looking at their phones. MELODY GERACI: We're crazy distracted. We're crazy distracted. After speeding and failure to yield, distractions are the number three cause, particularly with electronic devices. SCHAPER: Melody Geraci is with the Active Transportation Alliance, a Chicago group advocating for better walking, cycling and public transportation options. She says it's not just those behind the wheel distracted by the devices, but a growing number of pedestrians, too, who can become oblivious to traffic around them. But she says the bigger problem remains the speed of car. GERACI: Speed is a killer, for sure. If a pedestrian is struck at 20 miles an hour, they have a 10 percent chance of dying. If they are struck at 40 miles an hour, they have an 80 percent chance of dying. SCHAPER: According to the report, about 75 percent of pedestrian fatalities happen at night. Seventy-two percent of those killed are not crossing at intersections or crosswalks. And then there's this. JONATHAN ADKINS: Alcohol plays a big role. SCHAPER: The Governor's Highway Safety Association's executive director, Jonathan Adkins, says 15 percent of pedestrians killed each year are hit by a drunk driver, and a third of pedestrians killed are legally drunk themselves. That's right - one-third. ADKINS: It's not just about don't drive drunk. It's don't walk home at night when you're hammered. SCHAPER: Adkins and other safety advocates say lower speed limits, better road designs and more sidewalks can help reduce the fatalities. So can new vehicle technologies that alert drivers to pedestrians, though many drivers are confused by the technology and disable it. But ultimately the findings point to personal responsibility, both of the driver and the speed they're going and the pedestrian and the condition they're in. David Schaper, NPR News, Chicago. Transcript provided by NPR, Copyright NPR.